With November comes celebrating holidays with friends and families. Are you having guests for Thanksgiving or Christmas? 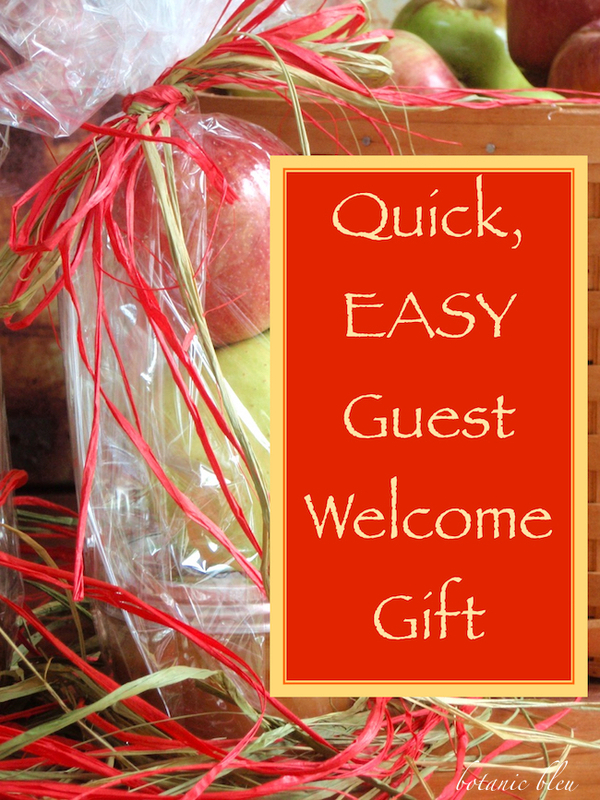 Many of us are, and one thing that always is a nice surprise for a guest is a welcome-to-our-home gift. With all the cleaning, buying groceries, cooking special treats, and gift buying for Christmas, our schedules do not have many spare moments for extras. 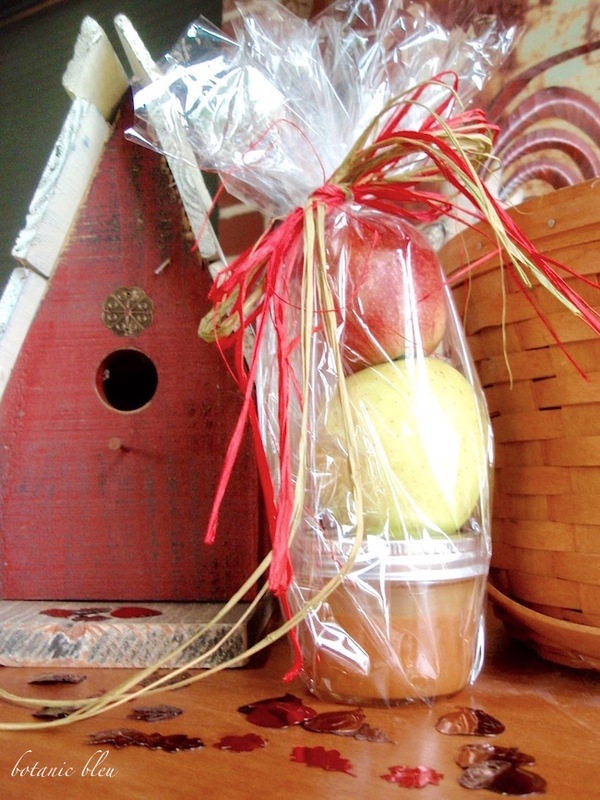 A quick, easy guest welcome gift is a caramel apple gift bag which can be assembled super fast using apples and ready-made caramel sauce from the grocery store. How easy is this welcome gift? Check off the ways. No added stops for shopping. When doing regular grocery shopping, just add the supplies needed to your grocery basket. At least five of the seven needed materials are sold in grocery stores. Raffia may not be in your grocery, but look in the seasonal section. You may find it. If your store has none, then order it online to avoid making an extra shopping stop/trip. Open the ready-made caramel sauce and transfer 4 to 6 ounces to the wide-mouth canning jar. The wide mouth makes it super easy for your guest to dip apple slices into the caramel sauce. Standard size jars of ready-made caramel hold about 12 ounces of caramel sauce. Enough for 2-3 canning jars for dipping. Large box stores have bigger jars of caramel sauce if you are having a large gathering and need to make several of these fast and easy gift bags. Cut off a large section of clear wrapping paper. Select 3-4 pieces of red raffia and 3-4 pieces of green raffia for each gift bag you are making. Combine the red and green raffia pieces for each bag and lay aside where you can easily reach them. Place the jar of caramel sauce in the center of the plastic wrap. Place a green apple such as Granny Smith on top of the canning jar of caramel sauce. 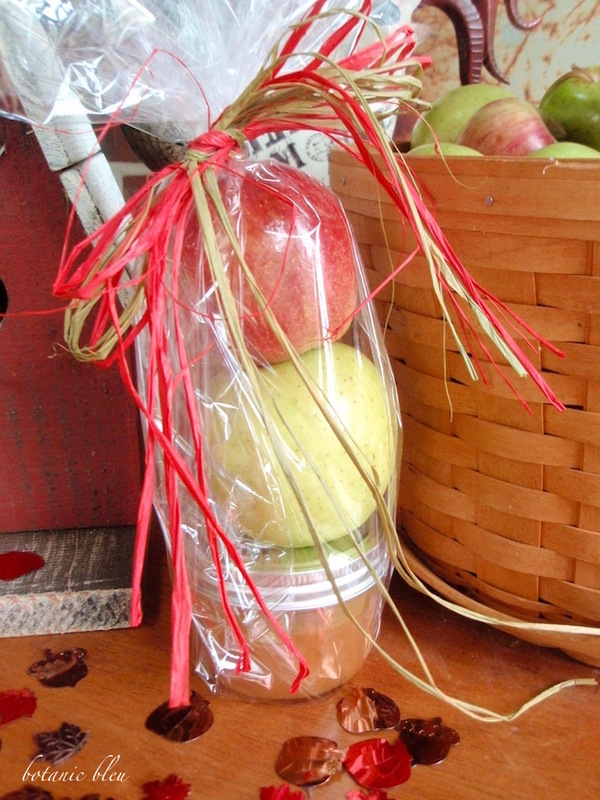 Add a red apple to the top of the green apple and pull the plastic wrap around the stacked apples and caramel jar. Have a helper hold the clear wrap together while you use the red and green mixed raffia to tie a bow to hold the bag together. 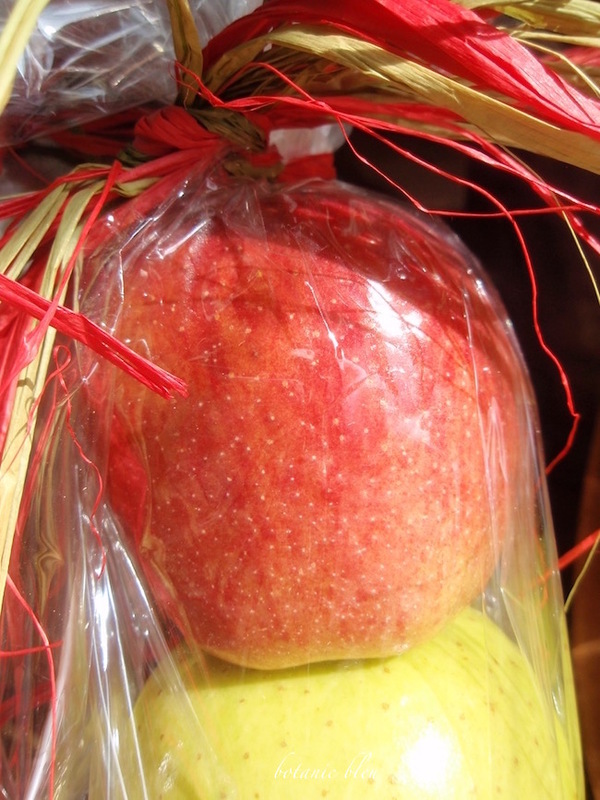 The finished bags make a festive arrangement with a basket of apples for a kitchen island or buffet display during a meal. 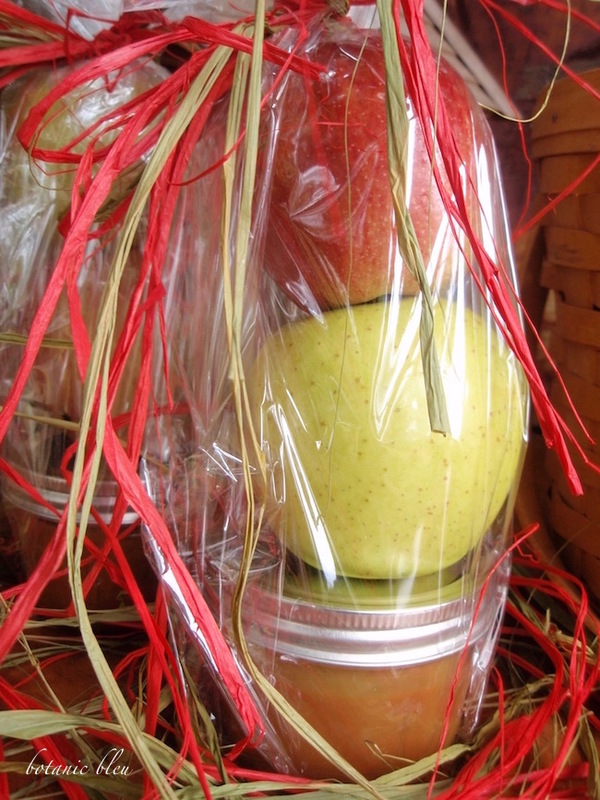 Then guests can take a caramel apple gift bag home as a party favor. 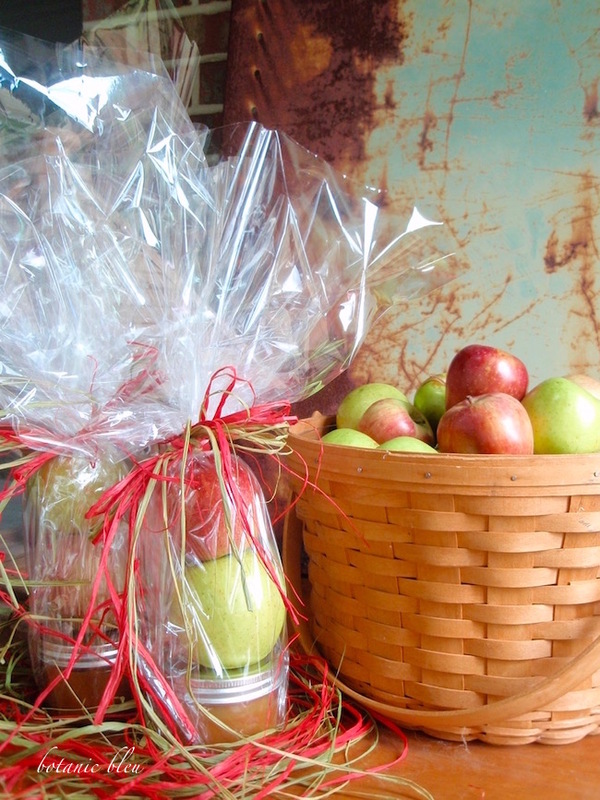 For overnight guests, place the caramel apple gift bag and a knife for slicing the apples in a small basket in the guest bedroom. Remember to include plenty of napkins. The caramel-dipped apples are a tasty night time treat or the guests can take the caramel apple gift bag with them when they go home. By putting the caramel sauce in a jar for dipping instead of coating the apples with caramel sauce, your guests can choose whether or not to eat the caramel sauce. 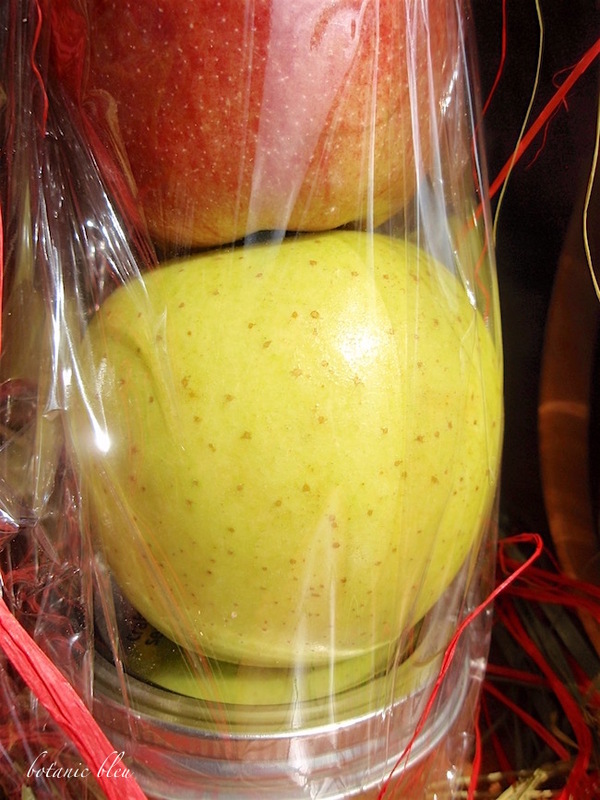 For people on a diet, they can still have an apple for a treat and not break their diet. We're never too old to enjoy a special surprise gift even when it is a quick, easy welcoming gift. We are also never too old to love to win a give away. See Fall French Sunflowers for directions about how to win a pillow cover of your choice from Elliott-Heath Designs. 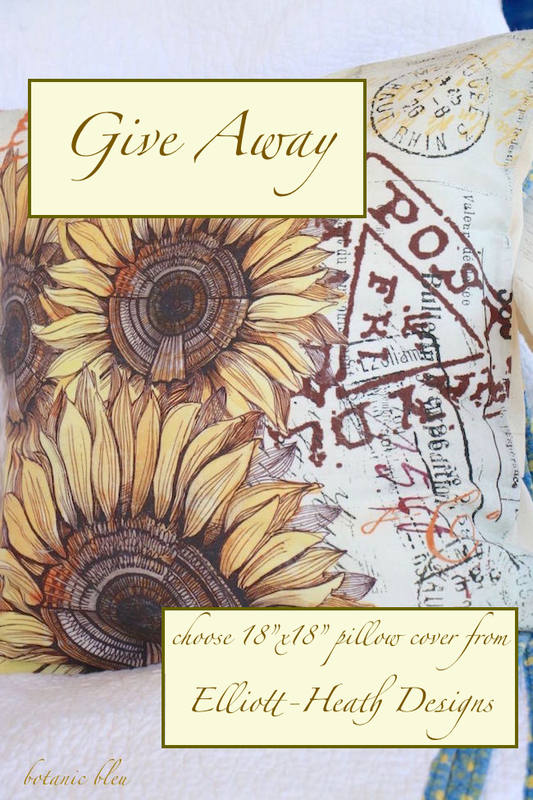 The give away ends at 6:00 a.m. (CST) on November 6, 2016, and one lucky winner will be selected at random. I love homemade gifts they're simply the best because they come from the heart. Great idea I may do this for my neighbors this year. Thank you for the inspiration! I need to look for the Marzetti peanut butter/caramel dip because my sister loves dipping apples in peanut butter. Might make a good stocking stuffer for her. What a great gift idea, Judith! I'm always looking for inexpensive but impressive ideas for "favors" when I have guests. This one is perfect! Thanks for sharing! What a nice treat for your guests. Apples and carmel - win win. Cute idea! I'm going to do this! That is adorable. I love caramel apples. Such a chute and simple idea! This is a great treat and a lovely idea. I am going to have to do this. Thank you for sharing at Dishing it and Digging it link party. It's great having you.